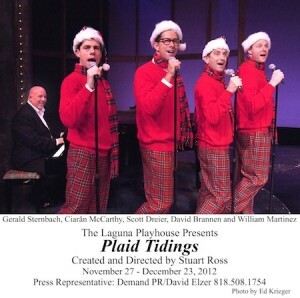 The holiday musical “Plaid Tidings,” at the Laguna Playhouse, runs through Dec. 30. It is 1964 and Sparky, Smudge, Jinx and Frankie, members of “Forever Plaid,” a doo-wop group along the lines of ‘50s clean-cut boy bands, are en route to their first big-time gig. When their car collides with a bus filled with parochial-school girls on the way to see the Beatles make history on the “Ed Sullivan Show,” the girls are unscathed but the hapless four perish instantly. Presumably, they now sing among the angels. Even so, Stuart Ross, writer-director of the Laguna Playhouse production “Plaid Tidings,” continues their story, a holiday version of his 1990 hit “Forever Plaid” albeit somewhat differently. Aided by cosmic forces including a heavenly phone call from Rosemary Clooney and perhaps a push from Santa, the lads get to return to earth to play the one concert that might have propelled them to fame, a “Mission of Harmony,” before having to return to the spirit world forever. Scroll forward to Dec. 1, 2012, the musical’s opening when Sparky (David Brannen), Smudge (Scott Dreier), Frankie (William Martinez) and Jinx (Ciarán McCarthy) sing, dance and occasionally bumble their way across a stage set designed to resemble the interior of the Laguna Playhouse. The newly embodied quartet, clad in plaid and requisite chinos, has landed in Laguna Beach, home to heretofore unseen palm trees and beaches, to not only get that shot at fame but to bring holiday cheer to a packed house dressed, for the most part, in plaid. Opening invitations stipulated either evening dress or at least something plaid, a suggestion that Richard and Joanne Milo of Corona del Mar heeded by purchasing matching plaid pajamas at Target and, thus attired, even garnered applause led by Playhouse executive director Karen Wood. 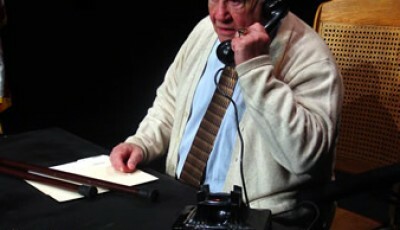 “We love the Playhouse and this is our first ‘Plaid Tidings,’ so we decided to go all out,” said Richard. By the second act, the Plaids really hit their groove with Frankie, suddenly left on stage to his own devices, puts his own spin on “Santa Claus is Coming into Town” by expressing alarm at the Orwellian implication of an all-seeing Santa and “Rudolph the Red-nosed Reindeer” as a sad little outcast who finally gets the love when his nose turns out to be a handy light fixture. Those numbers keep the sentimentality quotient within bounds, while musical choices such as the “Dreidel Song” and a holidayized “Jamaica Farewell” and “Mele Kalikimaka” offer a spirit of cultural inclusiveness. The Plaid’s inevitable departure from the material world adds a note of poignancy but with audience participation spirits remain high. Playhouse artistic director Ann Wareham regards “Plaid Tidings” as a seasonal gift to the community. “I chose to include ‘Plaid Tidings’ this season because it’s a joyous holiday treat and a well-crafted nostalgic musical that celebrates simpler times and makes everyone feel good,” she wrote via email. In that spirit, a Nov. 16 fundraising gala, attended by 300 guests, turned out to be an early holiday present garnering $50,000 for the 91-year-old Playhouse. Surf-themed festivities included an auction where Playhouse trustee Lisa Hale bid on a walk-on part in “Plaid Tidings” but reportedly has yet to hit the boards.